Old town streets in Tallinn, Estonia. Residents of the tiny Baltic republic of Estonia have a reputation for being practical, down-to-earth, and forward-looking. The country boasts one of the world's highest rates of mobile phone and computer use. The coding for Skype was written here. But allow the conversation to turn to the supernatural and the stereotypical, and the sober-minded Estonian disappears in an instant. "Of course we have a ghost! This is Tallinn!" Anne Orro, a gray-haired receptionist in the medieval capital, exclaimed one rainy October evening recently. "It's not normal not to have a ghost." Estonians do not celebrate Halloween. The holiday that most kids in North America and many in other parts of the English-speaking world look forward to for months has not caught on across much of continental Europe. But why care about costumes and plastic pumpkins when you've got the real thing? That's what most Estonians think. You can't walk far in the darkened streets of Tallinn, especially at this gloomy time of year, without running into a ghost  or the story of one, at least. There's the aunt of the friend of a young hotel clerk who lives across the street from an old graveyard that was bulldozed by the Soviets. She's seen white-robed figures drifting in and out of the place late of an evening. "As far as I know," says Krell Lomakin, the clerk who relates the story straight faced, "she's not crazy." A barber, happily snipping away at my hair one evening, volunteered how she'd often seen a former resident of the building, an old woman, perched on a stuffed chair in the corner next to a stack of women's magazines. Then there's the "devil's party" room, an apartment on the top floor of a 15th century manor house that emits strange sounds after midnight. According to legend, a mysterious man in a cape rented the apartment a few hundred years back; a neighbor who peaked around the door to find out what all the noise was about one night saw the devil himself. The single window in the room is now bricked up and the glazing painted with a fake curtain. According to a clerk at a nearby hotel, a Dutch diplomat who not long ago rented rooms the floor below, was on several occasions so spooked by the unexplained noises that she spent the night at his hotel. 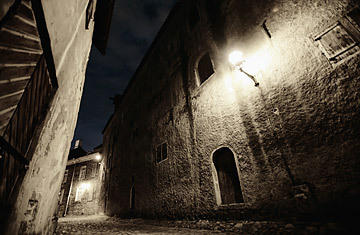 Tallinn seems made for such spooky tales. The medieval city is one of the best preserved in Europe, its 13th and 14th century gabled buildings built when Tallinn was a major link in the chain of Hanseatic trading centers that stretched across the continent's north. As the days grow gloomier in October, the atmosphere lends itself to the appearance of apparitionsimagined or not. Low clouds scud across the gray Baltic waters. The streets empty out as summer visitors who came for the parties and cheap beer head home. Centuries of sieges, plagues and political intrigues leave a catalogue of spine-chilling tales: screams emanating from the "Maiden's" tower on the edge of the high town where prostitutes in the Middle Ages were once imprisoned; spectral wanderings of a French mercenary who fought for the Danes and skinned his prisoners alive. There is even a 'Ghosts' St., a desolate alleyway in a corner of the town only recently lit at night. The setting could probably make a believer of anyone. "This is an old building," the porter at a small local hotel, converted from a 15 century storehouse, told me. "Don't be surprised if you run into a ghost." Several staff at the hotel have reported hearing babies crying when none were staying in the hotel. Footsteps echo along empty corridors. "What on earth are you doing there?" my 11-year-old daughter sensibly inquired on the phone one day when I explained where I was staying. It's a question all visitors to Tallinn could find themselves trying to answer should they meet one of the more unusual locals.